King of Yemen and Ethiopia, his name was Abraha. He made a Church in the city called Sanaa but when he got to know that people are traveling miles away to perform Umrah and Hajj and do Tawaf he got jealous. Abraha wanted people to make Hajj at Sanaa. But this made Muslims of Quraish furious, and Muslims disowned whatever he was saying which made Abraha go crazy as Muslims had kicked his idea of performing Hajj in his Church. To take revenge on Muslims, he builds an army having a huge number of Elephants, and charge the army towards Makkah. He had an Elephant whose name was Mahmood, it was huge and Abraha was riding it himself. After reaching Makkah, his attack was successful furthermore, the camel of Abdul Muttalib (RA) was also caught by his Army. At that time Abdul Muttalib (RA) was the leader of Makkah and the custodian of Holy Mosque. He went to Abraha’s army and asked for the camel they captured, after listening this Abraha was very shocked that they are here to attack Kaaba and Abdul Muttalib (RA) is just asking for Camel. They give Abdul Muttalib (RA) his camel, and he left. Before leaving Abdul Muttalib (RA) told Abraha that Allah has promised to protect his house (Kaaba) so he will protect it. After coming back, Abdul Muttalib (RA) told his nation to hide in caves. Abdul Muttalib (RA) went to the door of Holy Kaaba and make dua to protect the people in caves. 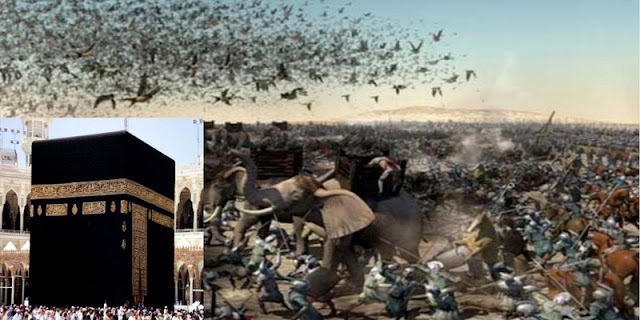 Next day, Abraha’s army was ready to attack the Kaaba but a very strange thing happened that none of the Elephants stood up! Then a flock of Ababeel came, they were sent by Allah and they had free gavels each, two in their claws and one in their beak. They flew over the army of Abraha and threw gravels on his army. These tiny objects, by the command of Allah, became so lethal that it piece their bodies of that army. The whole army was in shambles as they wanted to save their own lives, but Allah had commanded that each gravel will fall onto each person, and just in a moment the whole army was dead.